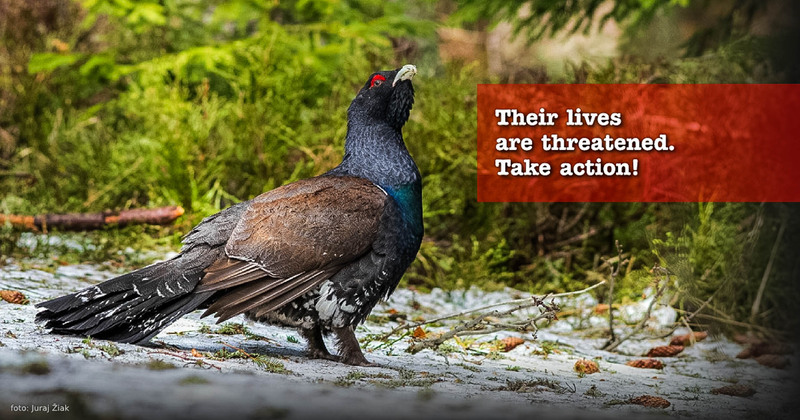 Save the Western Capercaillie in Slovakia! The Western Capercaillie, also known as the wood grouse is the largest member of the grouse family. The abundance of this iconic symbol of the ancient forests depends on habitat quality. It is the highest in sun-flooded open, old mixed forests with spruce, pine, fir and some beech with a rich ground cover of Vaccinium species. As habitat specialists, they hardly use any other forest types. Over the last decade, a dramatic decline of the Western Capercaillie in Slovakia has been recorded. This magnificent wood grouse has become extinct in many localities and is now near the point of national extinction. Yet this alarming situation points at another even more serious danger – the danger of the destruction of mountain ecosystems. The situation in Slovakia is really critical! said Rasto Micanik, from Arolla Fond, Slovakia. The main reason is extremely intensive and expansive logging in natural mountain forests, and their unnatural transformation into commercial and artificial forests resulted to the extraordinarily poor biodiversity. A disastrous impact to the whole forest ecosystem, including the Western Capercaillie population, is outcome of the “a fight against the bark beetle” as well. Chemical toxins within so called the “regulation programme” are used, and practically all trees are eliminated from the forest. This is occurring at the large areas, including inside the protected areas! Please, help local initiative to stop the devastation of the areas where the Western Capercaillie still lives. This initiative mainly focus to support systematic monitoring of the theatened areas, providing consistent and reliable information to the competent decision makers, the ratification of the Programme on how to save the Western Capercaillie, addressing a complaint to the EU Commission if necessary, and further necessary measures. concluded Rasto his short discussion with Vlado Vancura, Deputy Chairman from European Wilderness Society.